in which he states that our contemporary landscape is increasingly inscribed and articulated through images, and that the way we frame those images, the connotations, associations and mythologies they are attributed with, modify the image and the range of meanings it communicates. I thought this was interesting in relation to the public art projects and regeneration of Sheffield city centre. As a writer, I’m particularly interested in how text relating to these images might frame our perceptions of Sheffield, and, by extension, our social identity as members of this city. This relationship between image and text is something I’ve been thinking about as part of my residency at Bank Street Arts, which focuses on ekphrasis. Ekphrasis has its roots in Greek antiquity, and its purpose was to recreate in speech an artwork, with as much precision and detail as possible, so that the image might be reconstructed before the mind’s eye. Contemporary ekphrasis is, I think, less about mirroring the art source, but involves interpretation and translation from one artist and medium to another. Tamar Yacobi states that to re-present an artwork in language is to frame one act of communication within another. The perspectives built into the visual discourse are translated and incorporated into the verbal discourse. The source, whether it’s a painting, a film or architecture, for example, is being looked at by an individual and the resulting text is contingent on what that individual brings to the source; their experiences, values and agendas. 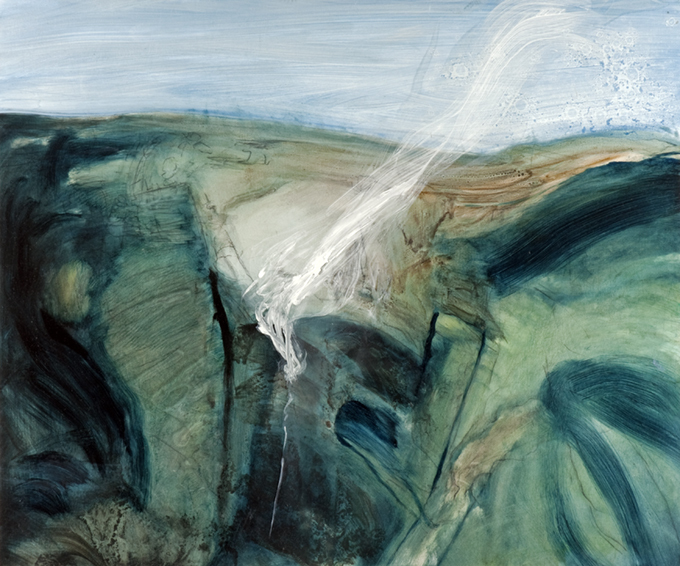 I want to look at this in relation to Paul Evans’ Seven Wonders collaboration with local poets, specifically his image of Kinder Downfall and the accompanying poem, ‘Phlegmatic’ by Fay Musselwhite. Although the image is not Sheffield-based, the proximity to Sheffield, and the way the poet makes use of this, provides an interesting look at the city’s relationship with the Peak District, and the strange way that Sheffield mingles urban and rural identities. The poem works by setting up the image of Kinder Downfall in opposition to an urban other, and a speaker that belongs to, or inhabits the city, but seeks respite from its ‘stale breath of banked air’ choking her ribs. This creates the potential for implying what the image of Kinder Downfall isn’t in relation to what the city is. The city is graffitied, it’s stale, the ‘market walls’ suggest commercial values. It could be read as a straightforward dualism: city bad, nature good. However, as the poem brings the city in, even as the speaker is leaving it behind, binaries break down; in lines such as ‘where paint has no purchase’, where the materiality of the image undermines the speaker’s claims for it. The echoes of sounds between ‘choked ribs’ and ‘stroke[d]… clear’, ‘graffiti’ and ‘trickled whisper’ draw the descriptions of the natural and urban landscape together, complicating and undercutting their apparent opposition. This, I think, reflects Sheffield’s position, and an attitude towards itself that takes pride in its city status, its smoggy heritage, as well as its relationship with the rural. This power of narrative is significant. We all like a story. If we turn to architecture, what’s the narrative of Park Hill flats, that huge image overlooking the city centre? What do we see when we look at Park Hill? I don’t know how I feel about the Park Hill renovation. I’m only thinking about the ways we might see, or be asked to see it. Its prominent position and history makes it an interesting and ambitious example of how the image might be rebranded. The front-facing section of Park Hill, the newly renovated part, has been emboldened, through the bright colours it uses, and potentially distracts the viewer from the rest of the complex awaiting development. But Park Hill needs more than an updated visual image to convince people of its value. It’s hard to overwrite old narratives. Many will find it hard to forget the bad reputation Park Hill has had for decades; conversely, others are affectionate towards Park Hill’s former communities, the streets in the sky, and perhaps some feel there’s been an appropriation of council housing for fancy apartments and profit. Whatever the truths are, they’re no match for people’s assumptions and prejudices. What Park Hill needs is a new narrative that Urban Splash can communicate to its detractors. I think one of the interesting things they’ve done to create (or mythologize) the narrative of Park Hill is that they’ve immortalized words spray-painted on one of the bridges: I love you will u marry me. By doing this, they have romanticized its past, and incorporated this romantic narrative of a bygone community into its present; on the one hand eliding the difficulties that led to Park Hill’s anti-social reputation, and, on the other, suggesting a respect for its history. Not only have Urban Splash retained the graffiti, they’ve recreated the text for their publicity banner that hangs over the front of Park Hill advertising the flats for sale, suggesting that this narrative is desirable, consumable. From what I’ve read about the couple that the graffiti relates to, the actual narrative is far from romantic, to the extent it might seem exploitative to have edited their story and presented it for mass consumption. The community that Urban Splash appear to be celebrating are unlikely to view it in this way. It is more likely to be those coming in from the outside that read the text as a slogan, representing a commemorative nod to a romantic past, and believe they can be part of a community, or a community spirit, by buying into this narrative. This made me wonder about the way narratives are constructed; the motivations behind them, who they are for. When we construct these myths we can bring people together, but the straight lines we select for a story to work must omit other stories. When we include some, are we necessarily excluding others? Public art can also be a way of creating a narrative, a brand identity for place, and is often evidenced as having positive effects on the community around it, with the potential to increase social and cultural capital, economic growth, community cohesion, a sense of pride and inclusiveness. Sheffield has a long history of public art and the regeneration of the city centre over the last 20 years has seen works proliferate. The walkway from the train station into the centre of town is lined with public art, from the Cutting Edge to the Running Man. It provides visitors to the city with a Sheffield brand that takes its industrial heritage as its materials, utilizing a frame that has ceased to benefit the city as it once did, mythologizing (or commodifying) the metalworker past as cultural capital. The poems written on the side of the Owen building by Andrew Motion, and in the Winter Gardens by Roger McGough, consolidate this version of Sheffield, or an ambition for the way we might want Sheffield to be understood. Roger McGough’s poem takes that metalworker heritage in his poem to celebrate the change from industrial landscape to open space, skies and stars, in a similar way that the artworks mentioned take the industrial past as their raw materials and mould them into art. The poem offers a way to read the artworks, to suggest an identity for Sheffield as a city that has been through a transformation, with its industrial heritage worn like a badge of honour. But as nice as the sentiment is, it doesn’t resonate with me. The steel industry in Sheffield is something they told us about in school; we watched films about the city before the Clean Air Act, but it always seemed past tense. On the other hand, people are being made redundant from what’s left of the forges right now. So we’re back to those straight lines of storytelling, and the agendas of the storytellers, whether they are personal, economic, or something else. McGough relies on the Sheffield cliché of steel, depression and South Yorkshire grit, the story of regeneration that he’s been told and retells. I’m not suggesting you have to be from Sheffield to have something interesting to say to (or about) Sheffield. I’m just interested in how we create meanings that aren’t intrinsic to an image through the power of language; how our perception of that image, and the effect it has in relation to the wider community, is contingent on this framing act. * Wallin, Jason, Deconstructing the Frame: Siting Absence, The Journal of Social Theory in Art Education; 2006; 26; ProQuest Education Journals pg. 346. The speaker in Phlegmatic, I feel, has nothing against the genuine flourishings of freely given graffiti that embellish our city. What she finds stale is bankable phrases such as the deeply cynical ‘Everyone’s a Winner’ around market developments in the town centre. The disregard for the private upset of the story behind the ‘I love you’ graffiti at Park Hill is certainly another example of how under- or working class culture is stolen and sold back to us. Exploitative indeed. And, as it concerns what we look out on as we move about our own landscape, not too dissimilar to the causes the right-to-roamers sought to address by their mass trespass on Kinder Scout in 1932.